Apparently, word has gotten out that Jessica and I live in Seattle, a city obsessed with coffee. I was never much of a coffee fan until Jessica introduced me to Turkish coffee a few years ago, which soon had me curious about espresso and other high-strength brewing methods (I still can’t drink “normal coffee” because it tastes watered down). A coworker recently caught my attention with an unusual device he kept on his desk. It’s made of industrial grade plastic, and doesn’t really look like anything to do with food, but he assured me that it produces some of the best coffee that anyone has ever tasted. It’s called an Aeropress, and it’s made by Aerobie, a company better known for frisbees than for cooking. I’ve been obsessed with this device ever since I got my first taste, and have been recommending it to friends and family alike for the last couple of months. When I woke up this morning in need of some coffee, I knew that it would be the perfect thing to use for my first “Tools and Gadgets” post. 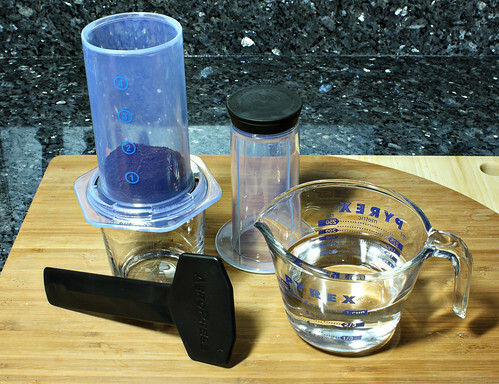 The aeropress basically contains 4 parts: the main chamber, the plunger, a stir stick, a funnel, and a coffee scoop for measuring. Pieces like the funnel and stir stick are made of what appears to be industrial strength black ABS plastic, and the main chamber and funnel are made of an equally-durable semi-transparent variety. The plunger also has a high quality rubber tip. 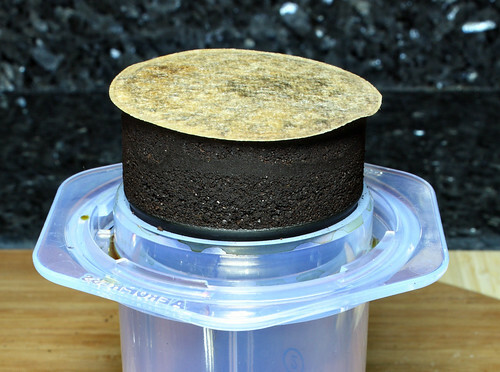 The aeropress uses small paper micro filters that cost about $0.01 each (the kit comes with 300 or so to start you off). You’ll need to provide your own coffee, water, and coffee mug. For the purpose of this demonstration, I chose to use a glass instead of a mug, so you can see the whole operation in progress. The funnel is only required to keep your workspace clean when filling the chamber, but it does a good job. The scoop is made to measure out enough grounds to make one “shot” of coffee, and the chamber has numbers on the side to mark out the water fill line, depending on how many shots you would like to make. You can use whatever grind setting you like with the aeropress, but I would recommend using as fine of a grind as possible so that you can get the best flavor extraction. The only caveat is that you will have to apply considerably more pressure with fine grinds, which some people may find difficult. When making coffee for myself, I usually measure out two scoops and fill to the 2-shot marker, but have found that I need less coffee when using an espresso grind to make larger batches. My coworkers and I have found that the water absorbs slowly into four scoops of espresso-grind coffee, and if we use four scoops and fill to the 4-shot marker, we usually only get 2 shots worth of coffee out. When making two double-shot cups with espresso grind coffee, we usually put in 3 scoops of coffee, but fill to the 4-shot marker. Aerobie recommends using water at 170–190°F (75–80°C), and I’ve found that the hot-water spout on the water cooler at work produces perfect coffee. At home, I use the automatic “beverage” setting on my microwave, which heats the water to just below 190°. I tried using near-boiling water a couple of times, but the coffee was so bitter I had to throw it out. Making the coffee couldn’t be simpler. You pour the water into the chamber, stir for 10 seconds, and press it into your cup. I should warn you that if you are making more than 2 shots with finely ground coffee, you will need to apply quite a bit of pressure to extract all of the liquid. It’s not uncommon that I have to put most of my weight onto the plunger in order to make four shots. Make smaller batches or use a standard drip-coffee grind setting if you find that you don’t like this effort — personally, I appreciate having to work a little for my food. For those who prefer something that looks a little less like tar, you can top off a single- or double-shot cup with hot water or (soy) milk to produce an americano or caffè latte. I haven’t quite figured out what it takes to get a nice crema like good espresso, but it appears to happen more frequently when making 2 shots at a time. Different styles of coffee beans also produce better crema than others, too. I miss the visual appeal of seeing crema on top of my coffee, but I usually like to drink my espresso with a bit of honey and the crema is usually gone by the time I’m done stirring, anyway. Cleanup couldn’t be simpler: you unscrew the black plastic filter cover from the bottom of the chamber, and press the plunger down all of the way to eject the filter and grounds into your compost bin. As you can see, the grounds are pressed into a “puck” just like in an espresso machine, so they won’t produce much of a mess if you prefer to use a trash can. Once the grounds have been ejected, you can just rinse the aeropress pieces under warm water (soap if you like) and set aside to dry. If you’re not trying to set things up for a photo shoot, the entire process takes about 60 seconds if your water is already hot. This makes it ideal to use at work; it doesn’t really take any longer to make yourself a good cup with an aeropress than it does to pour yourself a cup of the burnt overcooked drip coffee that you’ll find in most offices. You’ll soon find yourself sharing the duty of making “space coffee” as your coworkers get a taste, too. 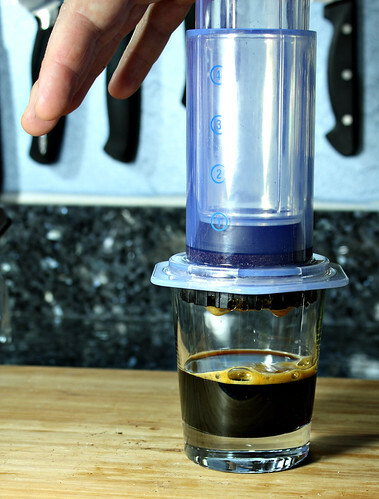 The aeropress costs $20-30 and is available online and in many brick and mortar stores. Replacement filters cost about $4 for a pack of 350. Compared to a $250 espresso machine (about as little as you can pay for a decent one), or the $10,000 Clover device Starbucks is starting to advertise, it’s worth every penny. Update: Please see the Aeropress inventor’s comments below about applied pressure. I still run into the occasional situation where I have to apply a decent amount of pressure (usually when making four shots from fine espresso grounds), but by following his advice you should be able to slowly press out a nice double shot of espresso with very little effort. I should also point out that the resulting coffee definitely tastes better, and even consistently has a nice crema on top (small bubbles that linger, unlike the larger foam shown in my photos, which quickly dissipates). I don’t drink coffee, so I wonuld work with say, a cup of Chai Tea instead. Hmm. Might have to look into it. The French Press I have works well, so no reason why this wouldn’t. I haven’t actually tried it with tea — I drink mostly loose-leaf tea and use an ingenuiTEA. I suspect that in order to get the benefit out of the aeropress for tea, you’d need to grind it up into a powder like you do with coffee. One other problem with tea (and the reason that I use a gravity-based device for tea) is that a lot of the nastier bitter flavor in tea is extracted if you press it (or if you steep it too long). I found that even the small amount of pressure from using a french press would occasionally extract too much unwanted bitter flavor from my tea leaves. I’m like you, and mostly use loose leaf. }:P The Chai is the only Tea that gets pressed. Aerobie has an international retailers page linked off of their homepage. Looks like there are at least one place in AU to pick them up. This is on my wishlist on Amazon. I think I might be getting it for Mother’s Day. And I love my ingenuiTEA. I buy most of my tea from arbortea.com. They have a larger organic/fairtrade selection than adagio. The art of pressing is to press GENTLY (about 15lbs) and WAIT for the liquid to flow through. That wait could be a minute or more but just maintain gentle pressure and patiently wait. When the liquid is gone, the plunger will sink down and bottom on the puck of coffee. If you press hard, it compacts the puck of coffee and blocks the flow. There is not need to press hard. Alan, thanks for the clarification. I guess some of us more computer-focused people emphasize the times in the instructions more than the other parts, and try hard to meet that “20-30 seconds” rather than getting the pressure correct. The old joke explains that the computer programmer never left the shower because the shampoo bottle said “lather, rinse, repeat” (but never said to stop). Update: Ok, so the rule we learn from this is “always listen to the guy who invented the device”. Coffee is significantly more robust in flavor while also being less bitter. I’m curious to try this with my turkish spice blend espresso tomorrow (I forgot to bring it with me to work today). I program computers too. I’ve often said that it would take thousands of lines of code just to “tell” (program) a robot to do a simple task like sweep the floor. 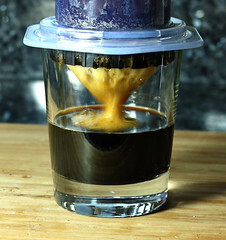 general medium roast brewing parameters – water at 200 degrees, 2Tbsp coffee to 6 oz of water, unless otherwise specified (like with the aeropress). Interesting. I would love to do a side by side taste test of coffee produced by this gadget and that made with my old French press. What a crazy but cool kitchen gadget. For $25 this would make a great press to take camping. I broke down though about bought an SBUX espresso machine last week. Should have waited to read this post. Hi, nice post. I have been pondering this topic,so thanks for sharing. I will certainly be coming back to your site. The simplicity of this gadget is the first thing you notice. My entire day revolves about the one cup of coffee I am allowed to drink each day. This looks like an excellent replacement for my drip system, although having trouble with my hands and shoulders, I am a little concerned about applying pressure down on to a scalding cup of coffee. Not so much the amount of pressure, but more the dexterity with which I could apply it. I foresee the whole thing skidding sideways with obvious consequences. This is of course purely in my case. I was thinking if I could house it all in a drill press? Henri, I’ve been delighted with my Aeropress for about a month now. I was initially worried whether or not I’d have the brute strength required to operate the Aeropress because I have tears in both my shoulders as well as a little bursitis. Well, no worries! I’ve found that just as Alan said above, all that’s needed is gentle pressure and a little patience. The resulting coffee is the best I’ve ever made at home. And by the way, I prefer the smoothness that results from water about 175 degrees. Will this compress down firmly a small amount of grinds? I’m actually hoping to use this to make a vegetable-herb juice concentrate, but it needs to be able to “squeeze” the juice out of maybe a few millimeters of fine grind. Will this do that? I’m not talking crazy pressure needed – just enough to get the majority of liquid squeezed out of a small amount of grind. I suspect you’d need at least 2tbsp of grounds (that’s one “scoop” in coffee terms). Any less and you probably wouldn’t get the kind of pressure you want to squeeze things out. The extra-fine grind would probably be a problem, too. I’ve found that anything finer than normal drip-coffee type grind clogs the filter and makes it REALLY hard to press. Espresso and turkish grinds are out, and powdered herbs tend to be closer to that turkish style grind.